Up in the Arctic Circle, Sweden's northernmost town Kiruna is under threat. Parts of the city are sinking, as expanding operations of an underground iron ore mine are starting to cause ground beneath it to give way. 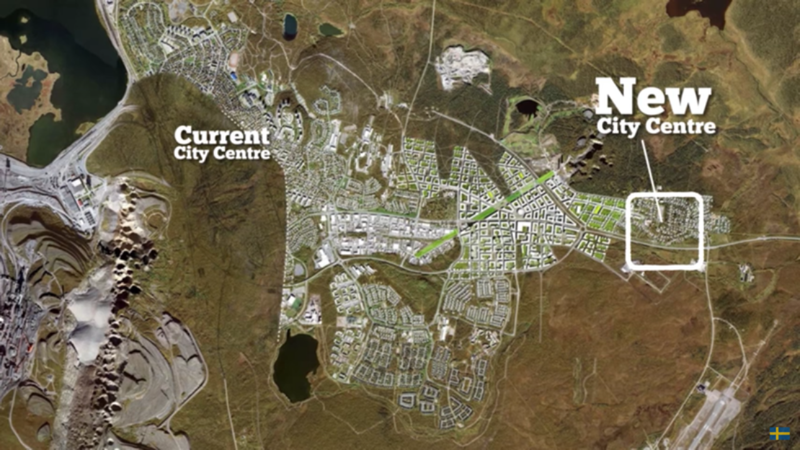 The solution is simple: Kiruna is being moved, piece by piece, two miles to the east. This is Kiruna: How to Move a City introduces us to Kiruna, and some of the people involved in the massive infrastructural undertaking to come – architects, residents – as the state-owned mining company prepares to shift some 18,000 people into new homes, in a town 90 miles into the Arctic Circle and in darkness half the year. Planners are designing the new Kiruna from scratch – building a more sustainable, more pedestrian-friendly town with superior infrastructure. It's an opportunity to start afresh, to fix many of the city's existing problems. But its residents, unsure of where they’ll live and work in a city that doesn't yet exist, also want to retain the character of the town. Some prized buildings, like the central church, will be picked up, put on trucks, and moved in their entirety to a new spot. Others will be taken apart and rebuilt brick-for-brick at the new site. But most will be entirely new. Residents are, mostly, behind the move (the iron ore mine, the world's largest, is crucial to the town's survival – most work for the mining company or have family and friends who do). But there is some resistance. Many are simply concerned about the cost, and the logistics. Some older residents lament the loss of sentimental attachments. How do you retain the culture of a town in a new space? Diggers broke ground at the site of the new town centre in 2014, but it will be at least another 25 years until the move is complete. With climate change threatening the survival of communities across the world (Kiruna is not the only town plotting a move), and huge population increases outpacing our ability to build new cities to cope, there's much to learn from Kiruna about the politics and cultural challenges of rapid urban change. It's being called the most radical urban relocation project of this century. But, lest we forget, it also somewhat mirrors the denouement of a late 90s episode of The Simpsons when Springfield is moved five miles down the road to escape its chronic garbage problem. "Our biggest challenge is not the design of the new city," says Mark Szulgit, of White, the architects leading the move. "The biggest challenge is to move the minds of the people and the culture."